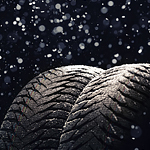 What Type of Winter Tire Does Your Vehicle Need This Season? Depending on the type of wintry conditions you typically encounter each year, you may be served better by putting a particular type of winter tire on your vehicle when the snow starts to fall. The tread patterns on winter tires make some tires better suited to snowy conditions or icy ones. Studded snow tires, for instance, can be outfitted with metal studs that greatly improve traction when driving over icy roadways. If they're allowed in your state, you may want to consider them in harsh weather. Studless snow tires have tread patterns specially designed for maintaining traction when it becomes difficult. They're designed to help deliver the studded winter tire driving experience without the studs. They do sacrifice performance on clear roads, which is why you also have the option of buying performance winter tires.